Happy Friday Owners! 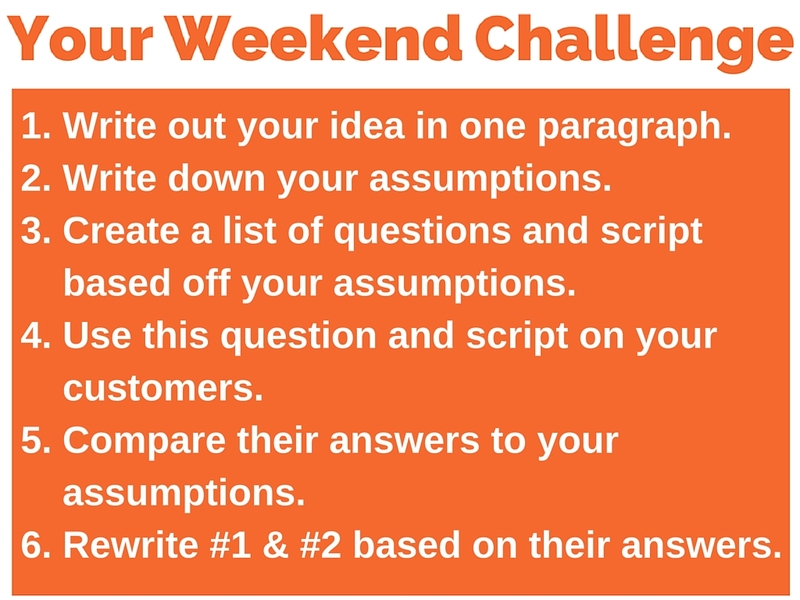 It’s time for another weekend challenge. This is where I give you a bit of stuff to work on over the weekend to increase your business. 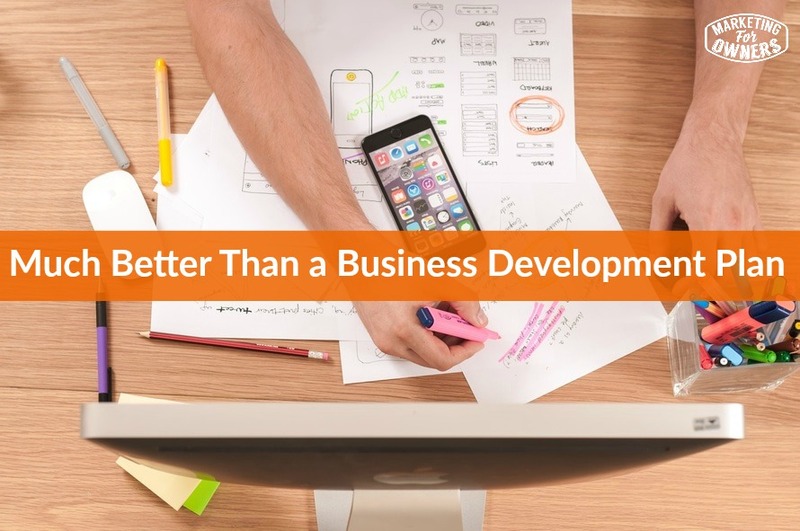 I know this is a strange title, but generally when we start businesses, or change things up, or even applying for a loan, we are often asked to produce a business development plan (and this is a good practice). Even if you have an existing business, it is good to have a plan and to know what you are going to do. The problem with a business development plan is that they are very detailed. They cover everything and what that tends to do is it pigeon holes or stifles the business because it creates a model. No matter what you do, you will try to fit in that model. But, business changes. I can promise that if you start a new business, or a new project and change direction today, it will change. It will because you will start off with assumptions, and many times your assumptions are wrong. But you will adapt and you will change because you will find out when they are wrong. You will adapt and this all comes back from customer feedback. In the Lean Startup Model (if you have not read The Lean Startup, I strongly recommend you do), software companies release software models and products which are not exactly ready. It will do for now. If you wait until it is completely ready, it never will be all the way and that is perfectionism. Get with others, get feedback and then change it and get with the program. You can keep doing this over and over and over again until it is perfect. What you end up with is a product the customer actually wants. Now this might sound strange because you are thinking, “I am not a software company.”, but we applied this to our Fire Protection Online company and it works. We did this and followed the Lean Startup Model and in the first year, we made 100,000 pounds. We are going to start with business assumptions not a business development plan. They are slightly different. Get your pen and paper and let’s get started. No more reams and reams of pages. You are not writing a novel and no one is really going to read it. Write out short succinct sentences. These are the things you are going to cover in your assumptions. From this list you are going to create a survey or get feedback. You are creating a new department or project for your business, you are going to invest time and money and employ people and you are going to hope it works. They will respect you for asking them and finding out what they like and how you can solve their problems. Don’t make it anything about you. Don’t just sit on it. Use it! What are you scare of? What are you worried about? Are you afraid that they are going to be annoyed with you? Don’t worry! Remember the assumptions and ideas you made at the beginning? Now, you are going to compare your customers answers to the assumptions from earlier. Go through this cycle several times over the course of a few months until you get a list of something that the customer says “yes I would pay for that service”. Honestly this service works. Many think that they don’t have time to do this, but many successful companies follow this example all the time. 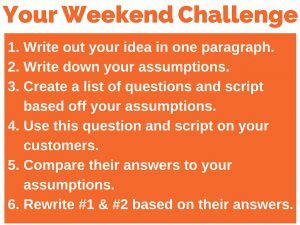 Have a nice weekend, enjoy this challenge and I will be back Monday with another great podcast lesson.